I bake too many sweet things. 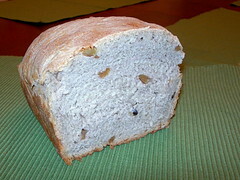 I want to bake more bread. 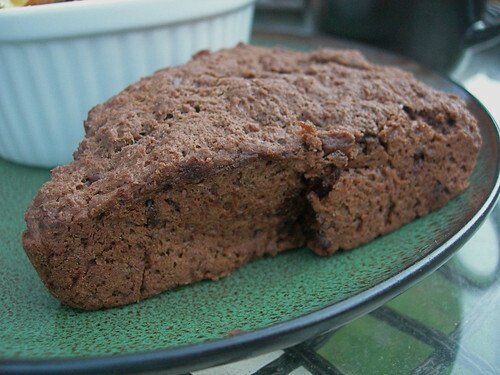 Et voilà, I found this recipe from Bread for Breakfast, and even better it used up applesauce and walnuts that I had used in the Great Vegan Brownie Experiment. It was delicious. The hardest part in baking bread is waiting, for the rising, for the cooling, and all the while your kitchen is full of delicious smells! 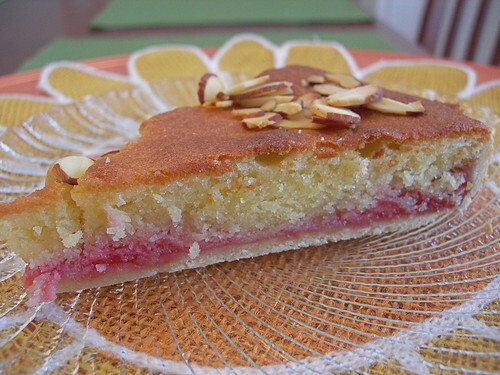 This light dessert consists basically of three parts - a shortcrust, a jammy layer, and a frangipane layer that is baked to a lovely brown and sprinkled with almonds. I did a little research for my jam layer, and when I found raspberries on sale, knew I would make a homemade raspberry jam. I mixed equal parts berries and sugar on the stove, pushed it through a sieve, and chilled it until it resembled jam. Apparently, raspberries have enough pectin that you don't even need to add any, but it was thinner than I would have liked after the straining process. 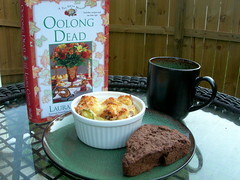 I'm a huge fan of the Tea Shop Mysteries by Laura Childs, and was happy to read Oolong Dead recently. Theodosia Browning, owner of the Indigo Tea Shop in Charleston, comes across a dead body while riding her horse, and has a mystery to solve. Incorporated throughout the book are mentions of dishes that are often found in the back of the book that you can make yourself. I declared tonight Oolong Dead Tea night, and made two recipes from the back of the book. With the Vegetable Egg Strata and Chocolate Sour Cream Scones, I prepared Oolong #8 tea from Adagio. I followed the recipe for the Vegetable Egg Strata except I left out the red peppers, and put the mixture in 6 ramekins instead of one square pan. I wanted the look of the individual servings, so I 1.5x the egg portion of the recipe, and ended up only baking them for 25 minutes. The eggs were just done, but not tough. 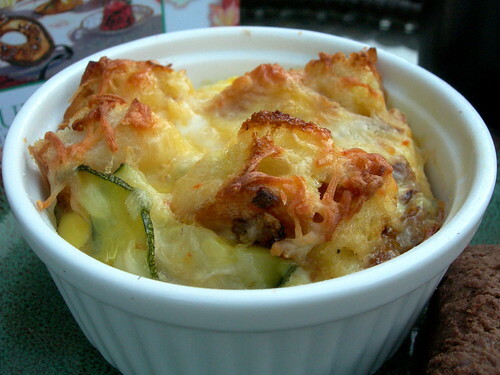 I had been given garden-fresh zucchini earlier today, so it was the star of the strata, as was the roasted garlic bread that I cubed up to put in it. This is a great recipe for using up leftovers, and could be adapted to practically any veggie/meat/cheese/bread combo. The chocolate sour cream scones were interesting. I have made scones with tofu, cream, and buttermilk before, but never sour cream! Against my usual scone method, I actually had to stir and knead them quite a bit to get the dough to come together, but it did not seem to have a negative impact on the final result. In her newest series, of which Eggs in Purgatory is the first, there was a recipe for sour cream biscuits with three ingredients. I made those as well, and they were a similar texture. I liked that they were easy and I always seem to have sour cream on hand! I'm a sucker for a novel that comes with recipes. What is your favorite? Somewhere out there is the great vegan brownie. I know, because I've had one in the past, and for years my friend Kristen and I have been talking about trying to replicate it. When I heard about the Worldwide Vegan Bake Sale, I decided it was the perfect opportunity to try out more recipes. I didn't sell the brownie experiments, but I think everyone trying one learned something about what goes into a vegan baked good. 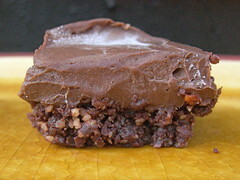 What is the perfect vegan brownie? It should be dense, fudgy, and not too obviously out of the ordinary - no weird aftertastes or textures. 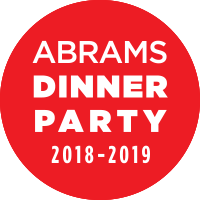 I'm not sure I got there with the three recipes I tried, but I have made some definite observations that I can share with you, and apply the next time around. What goes into a vegan baked good? There has to be a replacement for the eggs and butter, and some vegans don't use refined sugar (some recipes did, some didn't). 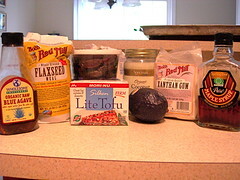 This is an array of the products I bought to use in the recipes, which were used in various combinations. Coconut oil is nice to have on hand because it is solid at room temperature, which few oils accomplish, and particularly in the raw vegan brownie, it added a lot to the texture. The container is full of dates, and I saw several recipes with dates or prunes in them. I didn't end up using a recipe with xantham gum in it, but now that I have it, I need to find a recipe with it in it to try. This was the most straight-forward recipe, using applesauce in place of fat, and a flax powder and water combination to replace the eggs. It had a nice fudgy texture, but ended up being the least favorite of the group (I brought the three batches in for tasting by the library). I blame the lack of nuts and the very present taste of the applesauce. 1. Preheat oven to 350 F. Coat an 8x8-inch square baking dish with nonstick cooking spray. 2. Stir together granulated sweetener, applesauce, and 2 tbsp water in a medium size bowl. In a small cup, mix flax powder with 1/2 cup water. Add to applesauce mixture and stir to combine. Add vanilla to this mixture. 3. In another small bowl, combine flour, cocoa, baking powder, and salt. Add applesauce mixture to flour mixture. Stir just to combine and pour into prepared pan. 4. 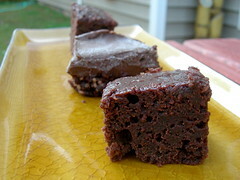 Bake for 40 minutes for chewy brownies. I love my co-workers for being willing to try all of my crazy experiments. But a funny thing happened. While my husband declared the icing to be the "worst thing he had ever tasted," there were five people in the library who declared Vegan Brownie Experiment #2 to be their favorite. Of particular interest was the icing, and really between the avocado and coconut oil, it was smooth and shiny and nice on the tongue. 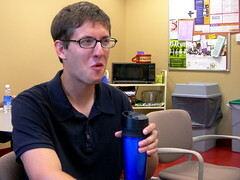 The taster shown above wanted to have the raw icing on Brownie #3, which he felt would be the winning combination. One of the librarians wondered what would happen if I tried figs instead of dates, and idea I am intrigued by and hope to try soon. The picture looks a little frosty because you throw the pan in the freezer to set it up and make it easier for slicing, but that step isn't necessary. 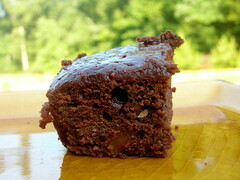 One of the benefits to vegan baking is that the nutritional content is more positive than a regular brownie recipe. Ironically the raw recipe had the highest fat content, but all the fat came from whole foods (avocado, coconut, walnuts), so it is arguable as to whether that is a bad thing. 3. Put all icing ingredients into blender and blend on high until smooth. 4. Spread icing over brownies and pop in freezer to set for 1 hour, then cut and put in snack-sized baggies (I popped them into cupcake liners). This brownie was the favorite of my co-workers among the three experiments, because of the texture, flavor, and crunchy walnut pieces. 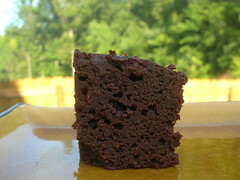 It was what I would call "almost" fudgy - more spongy than fudgy really. 1. Preheat the oven to 350 F. Mist an 8x8x2 glass baking pan with non-stick cooking spray and set it aside. 2. Place the tofu, water, maple syrup, carob or cocoa powder, oil and vanilla extract in a blender, and process until completely smooth. 3. Place the remaining ingredients, except the walnuts, in a medium-sized mixing bowl, and stir them together until they are well combined. 4. Pour the blended mixture into the dry ingredients in the mixing bowl, and stir them until they are well combined. Fold in the walnuts. 5. Pour the batter into the prepared pan. 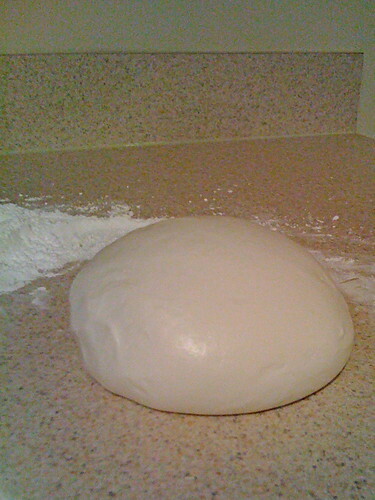 Bake on the center rack of the oven for 40 minutes, or until a cake tester inserted in the center comes out clean. Cool, cut, and serve. This is not the end of the vegan brownie experiments. There is a baked version with prunes that I want to try from The Millennium Cookbook, and I want to try just using egg replacer in a more standard brownie recipe to see if that makes a difference. I do feel like I learned a lot, and hope you did too! Sometimes food can just speak for itself. Ever since I saw these cookies on one of my favorite baking blogs, I knew I had to make them. 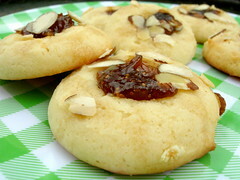 verysmallanna came up with this recipe for the softest ricotta cookies, topped with fig jam, drizzled with local wildflower honey, and then sprinkled with pistachios. I kept forgetting pistachios but had almonds. These are amazing. Seriously. You have no idea. Try them today. I hadn't ever played with fondant on cakes, but watching Cake Boss on TLC put me over the top, needing to get my fingers into a complicated project before the creative energy caused my body to spontaneously combust. Seriously, that is what it feels like might happen sometimes if I don't bake or play the piano (both seem to do the trick, but I don't have a piano at home, you see). I did quite a bit of reading beforehand, both online and in a few cookbooks. Next time I'm going to try homemade fondant using Zoe's recipe, because it looks like "real" rolled fondant. The first time I made it, I wanted it to be easy(er). So I went with the marshmallow fondant recipe I had seen several places. Peggy from What's Cooking America had directions that seemed pretty straightforward, so one evening last week I mixed up the marshmallow fondant and made the cake pieces. Another thing I've been wanting to experiment with is Meyer Lemons. I bought a bunch and made a lemon layer cake as well as lemon curd using those lemons. 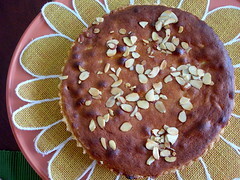 They are very fragrant, and I could smell something like tangerine as well as lemon, which made for a delicious cake! The most important thing to realize about Marshmallow Fondant is that it is MESSY. First you melt marshmallows, and then dump powdered sugar onto them. 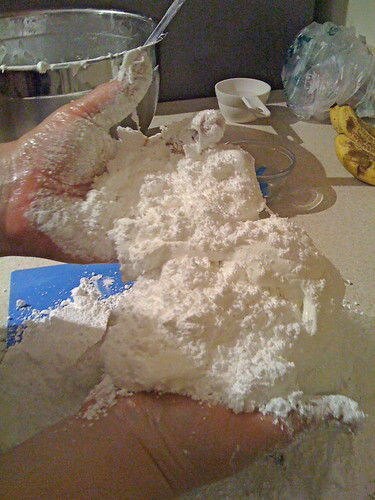 Some recipes have you mix this in the mixer, but this one had me mixing and kneading it with my hands from the beginning after spreading the counter and my hands with Crisco. I started laughing maniacally as I slathered everything with shortening and started trying to make a dough out of the messiest ingredients I had ever encountered. Eventually, without absorbing nearly as much powdered sugar as was in the recipe, it turned into a smooth, shiny, kneaded, bright white ball. I wrapped it tightly and let it sit out overnight. 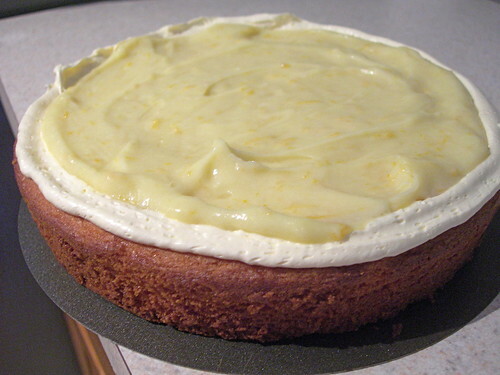 The next day I put the cake layers together with a thin layer of buttercream and filled with the Meyer lemon curd. I kneaded the fondant out and rolled it out, trying to make it as even and smooth as possible. At this point, if I had been paying more attention to the directions, I would have a circle about the size of the diameter of the cake plus its height, plus another inch for good measure. 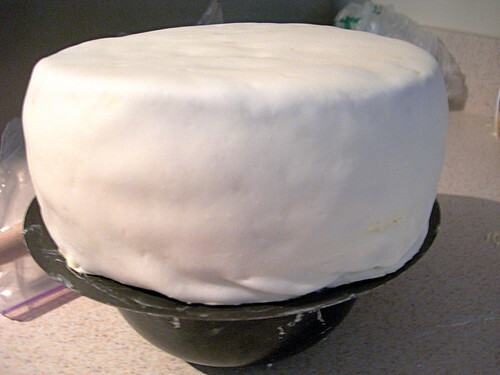 But I lifted the entire sheet of fondant up and tried to smooth it onto the cake. As a result it never got as smooth as I wanted, because first I had to try to smooth it down the sides and then cut off the extra. I wasn't really sure how much icing to put underneath either, and may have overdone it. It is really a balancing act - any less and the layers would have shown through quite a bit more, but any more and it would have squished out everywhere (it did a little on the bottom as it was). 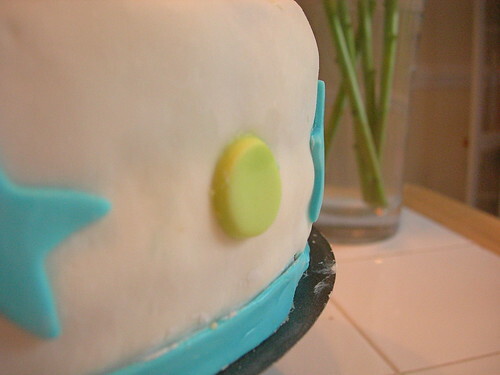 The remaining fondant got divided in half, and I added food coloring to each, making ball blue and the other neon green. That was slightly precarious, trying to keep the food coloring off of the counter and my hands, and a lot of handwashing was involved. The colors were vivid, but I definitely wish I had made the base of the cake one of these colors, rather than going with the basic white. I excuse myself by saying that this was all an experiment anyway! The final design is not life changing - just to show that I could put a band around the bottom and shapes on the sides and top (just using water). I left it overnight and was pleased to see that the colors had not bled into each other, and took it to work that morning. 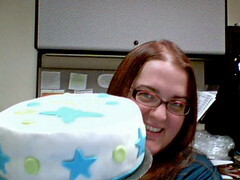 Most of it was consumed that day (thanks to a post in Facebook featuring me in my office holding the cake up to my webcam, which is the first picture in this post), but several days later the marshmallow fondant is STILL holding up and soft. Cutting through it was no trouble. I personally didn't care for the taste, as it was way too sweet for my tastes. But in my reading I found that the commercial fondant is most often peeled off of a cake before eating, and this was definitely edible, melding nicely with the buttercream underneath. 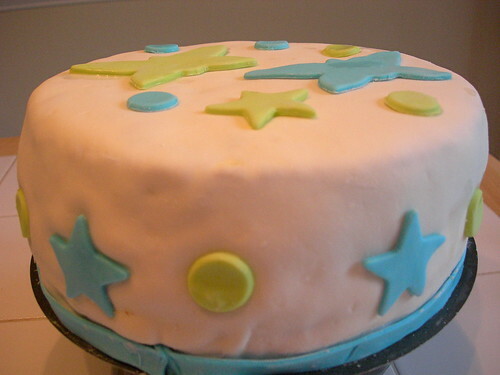 I liked the possibility for smoothness, for finesse, that fondant affords - I just need to play with it more. A few days ago, a friend who was actually my locker partner in 7th grade posted that she was going to make strawberry balsamic ice cream. I wanted the recipe, she didn't have one "yet," so I decided to try making my own. It all started with a trip with to Beechwood Farms in Marietta to pick strawberries with two of the amazing foodies I happen to work with. I wanted to make fresh strawberry ice cream, but I have struggled with getting to the right texture. 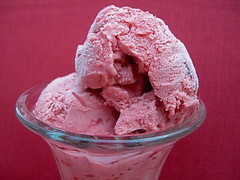 While I researched strawberry balsamic recipes, I came across a little tidbit that said that adding alcohol to ice cream helps it not get as hard. I imagine this has something to do with ice crystals, but I won't pretend to understand it exactly. I was willing to try anything. I did not find a recipe that was all that inspiring, so I decided instead to adapt one from Alice Waters, since I have been trying to make the recipes from her cookbook, "The Art of Simple Food." The end result was interesting. I probably should have mashed the strawberries finer because the bigger pieces wrapped around the spinning parts of the ice cream maker, but I loved the texture in this ice cream. The balsamic I added (probably a bit too much) added so much depth of flavor, and the alcohol added both depth and did help the hardness issue. However the ice cream didn't make pretty scoops, so I still have more experimenting to do. Adapted from Alice Waters' recipe for Strawberry Ice Cream, and a marvelous idea from an old friend. Set a strainer over a heat-proof bowl. Heat the half-n-half over medium heat, stirring occasionally to dissolve the sugar. When hot, whisk a little of the hot half-and-half into the egg yolks and then whisk the warmed yolks into the hot mixture. Cook over medium heat, stirring constantly, until the mixture thickens and coats the back of the spoon. Do not let it boil. Remove from the heat and quickly strain. Cover the mixture and chill. Chill thoroughly, and freeze in an ice-cream machine according to the manufacturer's instructions.